Six more weeks of winter? To me, it feels like it might be six more months. As we struggle here in the northeastern USA through a winter of seemingly epic proportions, it can be easy to believe that there will never be a respite from the relentless assault of snowstorms that has besieged the region since December. 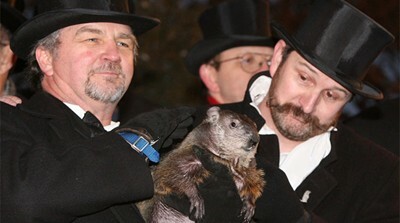 For this reason, it is no surprise that many folks look for the fun and comic relief of February 2, when the nation playfully waits with bated breath for the emergence of that one and only Prognosticator of Prognosticators, Punxsutawney Phil. I must confess to a touch of sympathy for the famous groundhog. When he is so rudely extricated from his lair in front of a screaming crowd so that he can make his fearless long-term weather forecast for humanity, the poor little rodent looks more than a little bit terrified, and I can't say that I blame him for wanting to bite the handlers that lift him high in the air for everyone to see. But this strange annual Pennsylvania ritual of ancient German folklore admittedly has its charm, for it manages at least for a moment to distract us from the emotional bleakness that we call the winter doldrums. Pennsylvania is a state (or a commonwealth as it is officially called, although in actuality there is no functional difference) that is rich in traditions and customs borrowed from its European ancestors, largely of Germanic origin. It is then no surprise that the Keystone State has a very rich brewing tradition as well, and to this day it remains one of America's leading states in both the number of breweries and volume of beer produced. 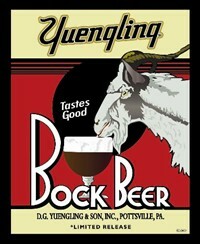 But no brewery between the Allegheny Mountains and the Delaware River commands more respect than the venerable institution that proudly resides in the states' east, the famous Yuengling of Pottsville. 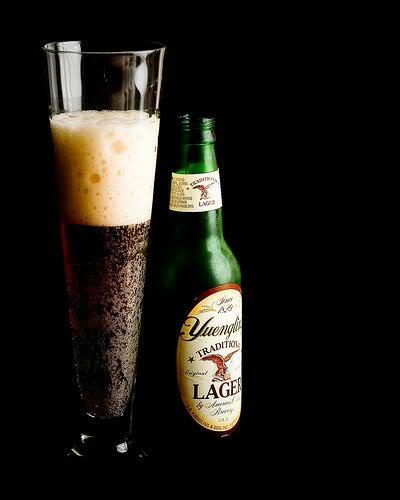 Yuengling rightfully prides itself as being the oldest continually operating brewery in the United States. 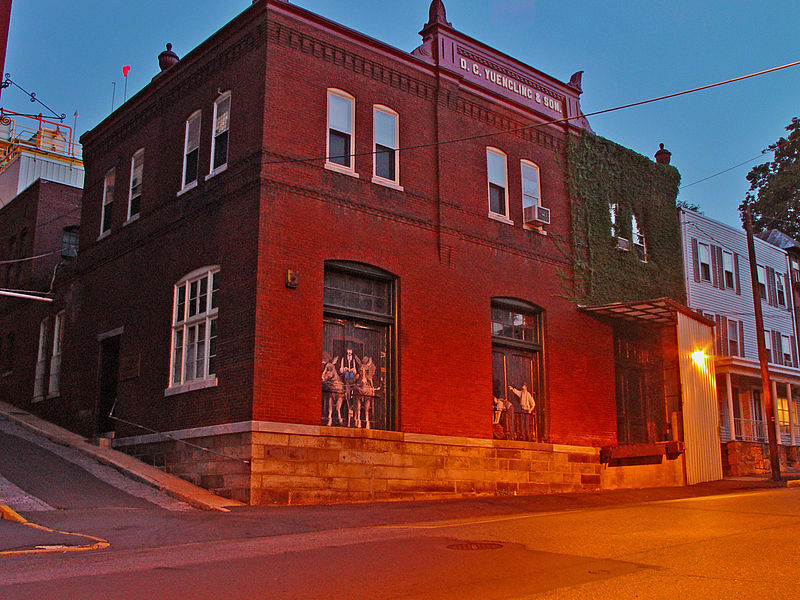 Founded as the Eagle Brewery in 1829, it has operated at the same location on Mahantongo Street in Pottsville under the Yuengling name since 1831, after a fire destroyed the original structure. Since that time, it has grown to be a ubiquitous fixture both in Pennsylvania and beyond, recently opening a new brewery in Florida as it has become one of the largest American-owned brewers in the country. Both locations brew a pleasant variety of tasty, sessionable beers. 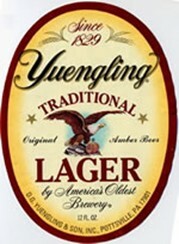 If you are sitting at a bar in Pottsville (or anywhere in eastern PA for that matter) and want to order the tastefully clean and dependable Yuengling Lager, it often is not necessary to ask for it by name. All a patron needs to do is generically request “a lager” and the bartender will usually understand exactly what the customer wants. In fact, customer loyalty for Yuengling in this region is so fierce that it actually outsells brewing giants such as Anheuser-Busch and Coors. Pennsylvanians tend to have a provincial bias toward many of their local products, and none more so than their cherished beers. products are technically lager beers brewed using bottom-fermentation and cold conditioning, as opposed to the warmer top-fermentation method that true ale products are produced from. This is a reflection of the Germanic traditions brought to Pennsylvania by its settlers, as well as the Yuengling family's own German ancestry and heritage. 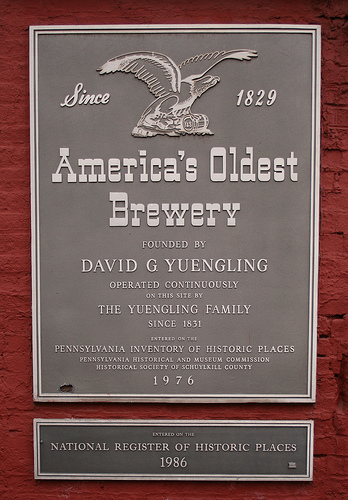 For many years, Yuengling's beers were actually aged in cold caves close to the brewery's location, just as lager beers in Germany were originally produced before the advent of refrigeration. Long since closed, a few years ago Yuengling re-opened the old caves as part of its enjoyable and fascinating brewery tour. Taking a tour through the Pottsville brewery is like taking a sentimental journey back into American history. The visitor to Yuengling is greeted with an attractive museum and gift shop that extensively traces the brewery's colorful history and contributions to Americana. From there, the tour commences and guides you through a series of halls and stairways (no high heels, please!) on a journey through all aspects of Yuengling's brewing process, from the mashing of the barley malt and corn grits to the boiling and cooling of the wort, fermentation, conditioning, and finally bottling of the finished product. A favorite part of the tour for many is the brewing room, because the huge, beautiful kettle employed by the brewery actually has attractive images in stained glass looking down upon it. This can give the visitor the distinct feeling that he or she has entered a veritable chapel of brewing. Who is one to argue with that impression? The tour concludes with a rest in the brewery's attractive tasting room, where visitors can sample a few generous servings of Yuengling's solid offerings. I have had the distinct pleasure of visiting the historic Yuengling brewery a few times over the years and I have yet to tire from relishing the experience. But my most distinct memory from my trips was not from the interesting tour itself, but rather from what I saw in the brewery's museum. Under a glass case, I discovered a letter addressed to the brewery from 1974. Reading it, I discovered that it was a letter of congratulation for the brewery's 150th anniversary. I was most surprised to find that the letter was from none other than the president of Anheuser-Busch himself, who commended Yuengling for its durable success and contributions to the American brewing tradition. I was greatly impressed by this acknowledgement, and that a powerful rival like Busch would show such veneration and respect. It is, in my humble opinion, a respect that is well-earned and deserved. Hopefully the famous Yuengling name will be preserved, since the current owner, Richard L. Yuengling, Jr., has only daughters and thus no male heir. Maybe it's time to break with tradition for once, and persuade the husbands of the Yuengling clan to adopt their wives' well-known surname. After all, there is no shame in being called a Yuengling!